Editor’s note: The following review is part of Macworld’s GemFest 2010 series. Every day from mid July through August, the Macworld staff will use the Mac Gems blog to briefly cover a favorite free or low-cost program. Visit the Mac Gems homepage for a list of past Mac Gems. SizzlingKeys is a nearly free System Preference Pane that lets you control a number of iTunes functions from your keyboard, including launching iTunes, changing songs, displaying the current song (including cover art), rating the current track, and opening playlists. I say nearly free because the vast majority of the program’s features (really all the features that you need) are available for free. But, if you want to add SizzlingKey’s pro features (controls like skipping forward or backward a specified number of seconds in the current track or muting the system volume) you’ll need to pay a $5 upgrade fee. But the truth of the matter is that the free version is all most people will ever need. While SizzlingKeys ships with a default set of keyboard shortcuts, you can customize those shortcuts to any keys that you choose. The only problem I ran into with SizzlingKeys came when I tried to use some of the Preference Pane’s pre-defined shortcuts, some of which conflicted with Spaces. So, when I expected to be adding a 3-star rating to a track, I instead ended up in Space-3. I also found that much of the functionality available in SizzlingKeys was already available in Keyboard Maestro, another utility I use regularly. The Spaces issue was easy enough fix, but it would have been better if SizzlingKeys at least recognized that some of its own shortcuts were being used by Spaces. 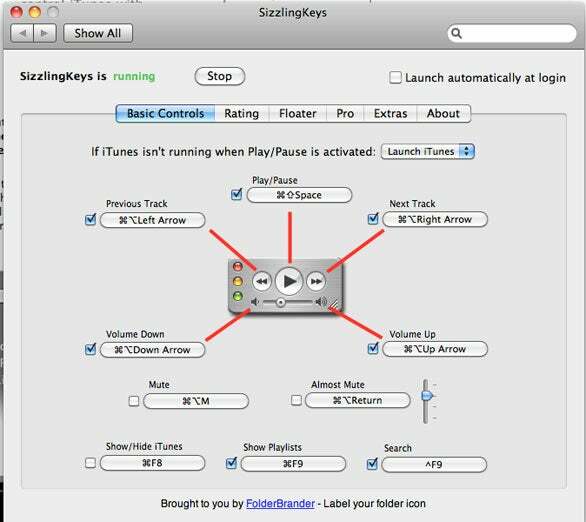 SizzlingKeys offers a free and easy way to control iTunes from your keyboard, which, if you’re an iTunes regular, goes a long way towards keeping you’re favorite tunes playing while your fingers go to work.